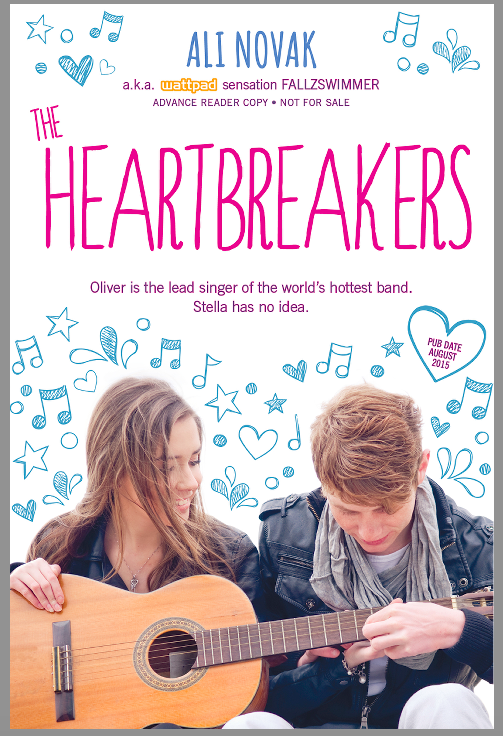 This week I was fortunate enough tor receive an ARC of “The Heartbreakers” by Ali Novak and it took just a few pages for me to realise that I was going to love the book and the author. I don’t know how I’m going to get through this review and give the book the justice it deserves without using a ridiculous amount of expletives, but I’ll give it my best shot. The first thing I want to say here is: UK paperback release, 31st August. Buy it. The premise of the story is pretty simple; a girl, Stella, one of a set of triplets, meets a boy while on a coffee run with her brother. She later discovers that he is Oliver Perry, the lead singer of her sister, cancer sufferer Cara’s favourite band, and, along with her brother, spends one carefree night with the band. She sends some photographs that she takes that evening to Alec, one of the band members and he in turn shows them to their publicist. Stella is then offered the opportunity of a lifetime running an online blog of photographs of the band for fans to follow- as well as ultimately reuniting her with Oliver. From this point on, a romance blossoms and sparks fly between the pair. In short? Ali Novak is a genius. A hilarious, sob-inducing genius. I love a good old clichéd chick-flick where boy meets girl and everyone lives happily ever after and this was definitely that. I loved how the author described the relationship between the three siblings, the relationship between the members of the band and I particularly loved the kindness that Alec showed Stella throughout the novel. It’s definitely a book that’s lighthearted, entertaining and not to be taken completely seriously- who on earth is going to meet a world famous rock star and have him fall head over heels in love with them? Not me, that’s for sure! But that is definitely part of the book’s charm- these events that seem all so unrealistic are all the more attractive. Additionally, I sobbed like a wee baby at the email from a viewer of her photography portfolio, as that particularly hit close to home for me. This is definitely the book to turn to if you’ve had a horrendous day- it’s cute, easy going, hilarious and just an all-round enjoyable read. If you like Rainbow Rowell and Stephanie Perkins, you’ll love this!